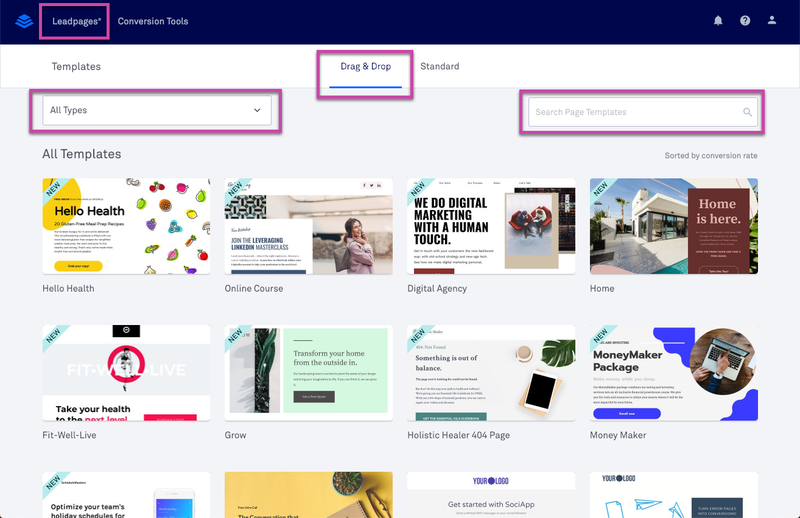 Every Leadpages subscription includes dozens of templates at no extra cost. You can browse template designs from the Lead Pages tab in your account dashboard, then "View All Templates." We offer two types of free templates: Drag & Drop and Standard. All templates are automatically sorted by conversion rate. Standard templates utilize our legacy builder and offer less customization. Although you can customize your pages’ text, colors, and fonts as well as hide any elements you don’t use, you cannot add additional content or rearrange sections within the Standard Builder. In our template browser, choose a tab to view Drag & Drop or Standard designs (as shown below). To narrow your search, you can use the “All Types” drop-down to filter templates by category. Finally, you can use our search field if you know what template you’d like to use by name—or to find templates that match a certain keyword. TIP: Templates from any category can be used for other purposes. In fact, some templates are listed under multiple categories. We strongly recommend choosing a template based on its elements, rather than its suggested category or purpose (especially for Standard pages).